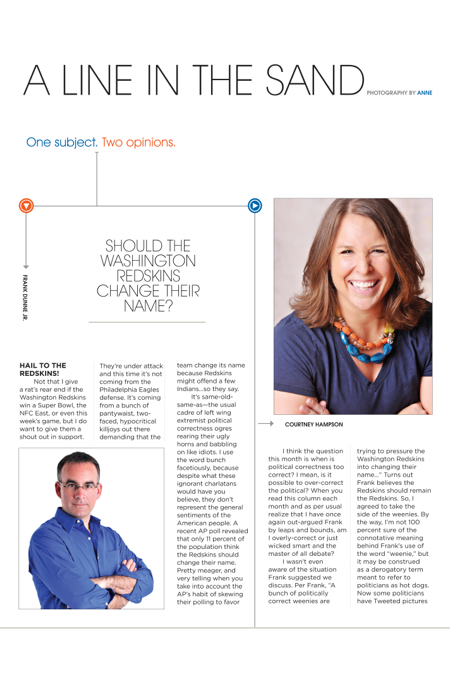 Hilton Head Magazines: CH2/CB2: Line in the Sand:Should Washington Redskins Change Their Name? Not that I give a rat’s rear end if the Washington Redskins win a Super Bowl, the NFC East, or even this week’s game, but I do want to give them a shout out in support. They’re under attack and this time it’s not coming from the Philadelphia Eagles defense. It’s coming from a bunch of pantywaist, two-faced, hypocritical killjoys out there demanding that the team change its name because Redskins might offend a few Indians…so they say. It’s same-old-same-as—the usual cadre of left wing extremist political correctness ogres rearing their ugly horns and babbling on like idiots. I use the word bunch facetiously, because despite what these ignorant charlatans would have you believe, they don’t represent the general sentiments of the American people. A recent AP poll revealed that only 11 percent of the population think the Redskins should change their name. Pretty meager, and very telling when you take into account the AP’s habit of skewing their polling to favor their own leftist agenda and always supporting political correctness causes. Whether or not they did it this time, the number still comes up a paltry 11 percent. Columnist and radio host Dennis Prager took that absurd rationalization to task, countering with, “If we ceased using all arguments or descriptions because some people feel offended, we would cease using any arguments or descriptions.” In other words, whatever you say, whatever you write, whatever you name something, it’s going to offend somebody somewhere. It’s just a fact of life. So where does this end? Should the New York Giants change their name because it offends short people? How about the Dallas Cowboys? Cowboys herd cattle to slaughter so we can eat steak and cheeseburgers. Well, that would offend vegetarians wouldn’t it? Better come up with a new name for the ’Boys. Hey! That’s it! Just call them the ’Boys. Nope, can’t do that. It might offend girls. As long as we’re in Texas, what about the Houston Texans? If Redskins offends Indians, doesn’t it logically follow that the name Texans should offend…Texans? And why single out the Redskins when you’ve also got the Cleveland Indians and Atlanta Braves? There’s a double whammy for you. Braves could offend both Indians and cowards, and we’d better tell the New York Yankees to change their name, too, because it might offend Southern people. Let’s see, who are we forgetting? Oh! The Philadelphia 76ers. Aren’t you political correctness monkeys always telling us that the Founding Fathers are frauds because some of them owned slaves? That should offend just about everybody, don’t you think? A few blocks up Broad Street, you’ll find the University of Pennsylvania Quakers. How come nobody’s sticking up for Quakers? Don’t Quakers have feelings too? Or is it only Indians who have such fragile psyches? Wow! Didn’t see that one coming did you? Have you folks ever considered that some Indians might be offended by your opinion of them as a bunch of spaghetti-spined emotional wrecks who can’t get through the day knowing that there’s a team out there called the Redskins? With some exceptions, team mascots are chosen to project qualities like strength, power, and courage. Redskins is a fine example of that, and it’s a compliment, not a slur. I think the question this month is when is political correctness too correct? I mean, is it possible to over-correct the political? When you read this column each month and as per usual realize that I have once again out-argued Frank by leaps and bounds, am I overly-correct or just wicked smart and the master of all debate? I wasn’t even aware of the situation Frank suggested we discuss. Per Frank, “A bunch of politically correct weenies are trying to pressure the Washington Redskins into changing their name…” Turns out Frank believes the Redskins should remain the Redskins. So, I agreed to take the side of the weenies. By the way, I’m not 100 percent sure of the connotative meaning behind Frank’s use of the word “weenie,” but it may be construed as a derogatory term meant to refer to politicians as hot dogs. Now some politicians have Tweeted pictures of their weenies, but I am not sure that is what he means either. You’ll recall that I don’t love hotdogs or politicians, so I remain neutral on this particular lack of political correctness. In February, The Washington Post published several columns urging the Redskins organization to change their name. In May, 10 congressmen sent a similar message to the NFL Commissioner and Redskins owner. Owner Dan Snyder’s response was, “We’ll never change the name. It’s that simple. NEVER—you can use caps.” Sounds like a lovely gentlemen. Never say never, Dan. With an all-time win-loss record of 552-527 you’re just barely breaking even. The last eight years or so have been especially unimpressive for your team. I bet some folks would say the Redskins will NEVER win a Super Bowl. What say you? But back to Halbritter’s point. Football as a sport bonds a nation, a city, a neighborhood, a family. The Super Bowl is the most watched sporting event each year. Yet, we divide this mass of football fanatics each time we use the slur “redskin.” When we think about racial slurs, they are typically black and white. So perhaps it is our lack of education around the Native American community that makes this slur acceptable to some? Perhaps it is the history and tradition behind the Redskins, which dates back to 1932, that has folks so against the change. That’s a bunch of hooey, to use a technical term. Historically, women were denied the right to vote, until someone realized it was wrong and changed it. Historically, black and white children weren’t allowed to attend the same school, until someone realized it was wrong and changed it. Historically, gay and lesbian couples weren’t allowed to marry, until someone realized it was wrong and changed it. It’s time for a change, Redskins. It is time for a change. Frank, Great piece about the Washington Redskins name change. You and Robert Griffin III said it well. Roughly 80% pf people who have an opinion say the name should stay. So why would the team change the name to placate some feigned insult. Time for these people to get a life and do something about real issues. I’m not a ‘skins fan either. Go Russell Wilson & the Seahawks!